A dark galaxy is believed to be an invisible galaxy composed of dark matter. The existence of a dark galaxy is still a hypothesis. The theory of the existence of a dark galaxy came up upon observing galaxy NGC 4254. It was observed that this galaxy collided with another galaxy because of the presence of gas being siphoned away into a tenuous stream, and one of its spiral arms is being stretched out. There is no evidence of another galaxy involved in the collision which brought up the theory of dark galaxies. Dark galaxies have no detectable stars and are believed to be invisible to the known visual spectrums. There is experimental evidence to support the existence of dark galaxies, although scientists have no conclusive evidence and continue their research. Scientists have proposed a means to track down the dark dwarf galaxies that should be orbiting the Milky Way, saying they have now found evidence of one. For the first time, dark galaxies — an early phase of galaxy formation, predicted by theory but unobserved until now — may have been spotted. These objects are essentially gas-rich galaxies without stars. Using ESO’s Very Large Telescope, an international team thinks they have detected these elusive objects by observing them glowing as they are illuminated by a quasar. Because they are essentially devoid of stars, these dark galaxies don’t emit much light, making them very hard to detect. For years astronomers have been trying to develop new techniques that could confirm the existence of these galaxies. Small absorption dips in the spectra of background sources of light have hinted at their existence. However, this new study marks the first time that such objects have been seen directly. The team took advantage of the large collecting area and sensitivity of the Very Large Telescope (VLT), and a series of very long exposures, to detect the extremely faint fluorescent glow of the dark galaxies. They used the FORS2 instrument to map a region of the sky around the bright quasar HE 0109-3518, looking for the ultraviolet light that is emitted by hydrogen gas when it is subjected to intense radiation. Because of the expansion of the Universe, this light is actually observed as a shade of violet by the time it reaches the VLT. “After several years of attempts to detect fluorescent emission from dark galaxies, our results demonstrate the potential of our method to discover and study these fascinating and previously invisible objects,” says Sebastiano Cantalupo (University of California, Santa Cruz), lead author of the study. The team detected almost 100 gaseous objects which lie within a few million light-years of the quasar. After a careful analysis designed to exclude objects where the emission might be powered by internal star-formation in the galaxies, rather than the light from the quasar, they finally narrowed down their search to 12 objects. These are the most convincing identifications of dark galaxies in the early Universe to date. 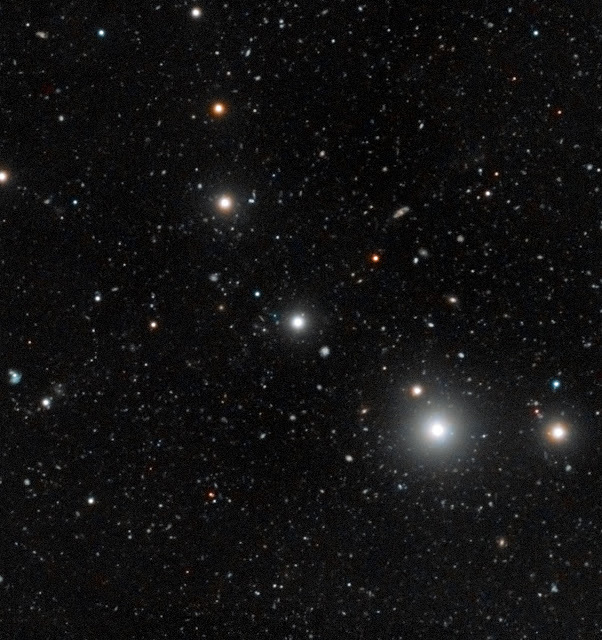 The astronomers were also able to determine some of the properties of the dark galaxies. They estimate that the mass of the gas in them is about 1 billion times that of the Sun, typical for gas-rich, low-mass galaxies in the early Universe. They were also able to estimate that the star formation efficiency is suppressed by a factor of more than 100 relative to typical star-forming galaxies found at similar stage in cosmic history. “Our observations with the VLT have provided evidence for the existence of compact and isolated dark clouds. With this study, we’ve made a crucial step towards revealing and understanding the obscure early stages of galaxy formation and how galaxies acquired their gas”, concludes Sebastiano Cantalupo. The MUSE integral field spectrograph, which will be commissioned on the VLT in 2013, will be an extremely powerful tool for the study of these objects. Fluorescence is the emission of light by a substance illuminated by a light source. In most cases, the emitted light has longer wavelength than the source light. For instance, fluorescent lamps transform ultraviolet radiation — invisible to us — into optical light. Fluorescence appears naturally in some compounds, such as rocks or minerals but can be also added intentionally as in detergents that contain fluorescent chemicals to make white clothes appear brighter under normal light. Quasars are very bright, distant galaxies that are believed to be powered by supermassive black holes at their centres. Their brightness makes them powerful beacons that can help to illuminate the surrounding area, probing the era when the first stars and galaxies were forming out of primordial gas. This emission from hydrogen is known as Lyman-alpha radiation, and is produced when electrons in hydrogen atoms drop from the second-lowest to the lowest energy level. It is a type of ultraviolet light. Because the Universe is expanding, the wavelength of light from objects gets stretched as it passes through space. The further light has to travel, the more its wavelength is stretched. As red is the longest wavelength visible to our eyes, this process is literally a shift in wavelength towards the red end of the spectrum — hence the name ‘redshift’. The quasar HE 0109-3518 is located at a redshift of z = 2.4, and the ultraviolet light from the dark galaxies is shifted into the visible spectrum. A narrow-band filter was specially designed to isolate the specific wavelength of light that the fluorescent emission is redshifted to. The filter was centered at around 414.5 nanometres in order to capture Lyman-alpha emission redshifted by z=2.4 (this corresponds to a shade of violet) and has a bandpass of only 4 nanometres. The star formation efficiency is the mass of newly formed stars over the mass of gas available to form stars. They found these objects would need more than 100 billion years to convert their gas into stars. This result is in accordance with recent theoretical studies that have suggested that gas-rich low-mass haloes at high redshift may have very low star formation efficiency as a consequence of lower metal content.